We create Blogging resource posts to help you excel as a new blogger. Use the great blog resource to grow your blog and skyrocket your blog traffic. Are you a blogger? Then you will know there are so many useful blogging gifts we would all love to receive. If you are not a blogger and need a list of the best gifts for bloggers to spoil your blogging loved one, you are in the right place today! As a blogger, there will always be blogging necessities. 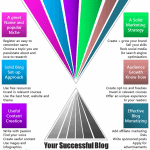 Like a blog, theme, plugins and all the other usual goodies, we need to run a successful blog. And, then there are the things we would love to have! Why? Because it makes our day to day blogging tasks so much easier and way more fun. These are the kind of items that make awesome gifts for bloggers! The list of blogging essentials is never-ending. This is because we progress daily on the road to becoming a thriving blogger. When starting a blog you need certain things. Then you start doing podcasts and webinars and your needs expand and change. Trying your hand at creating videos – more items you need. And this ever-expanding process will continue as your blog grows. Fortunately for friends and loved ones, this is great news, as it means there will always be a variety of items a blogger needs or wants. So whether you are enjoying your own blogging journey or spoiling a blogging partner or friend, here is a list of 50 amazing gifts for bloggers to choose from. There is something for everyone, whether they are starting out or are already a pro-blogger! Hope you enjoy this list of practical gifts for bloggers, just as much as I did when making it! Not too sure about the Perfect Blogging Gift? Be smart and buy a Gift Card! You have to consistently invest in your own growth and knowledge as a blogger if you what to be successful. The most important point is to know the good ones from the bad ones. The online courses I recommend here, are truly top notch. I have taken all of them and love them. And, I know you will too. One of my top posts on Brilliant Bloggers, list all the best blogging courses, freebies and resources you need to be successful at blogging. You can check out the complete post here. For today, I will only mention my all time favorites here. 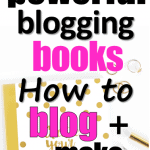 If you want to start and monetize your blog this is an absolute must-have. I have learned so much from the Blog by Number course! And, you can’t go wrong with this one. This course will teach you everything you need to know about writing posts quickly and efficiently. It’s presented in an easy to follow format, filled with tips and worksheets. This was one of my best investments. You can’t go wrong choosing this awesome book to start making money with your blog. It is filled with tips, hacks and solid information. Learn exactly how to make money by leveraging Pinterest. Grab your copy now as this is an absolute blogging must-have for anyone who wants to make money online! Learning everything you need to know about ConvertKit or Mailerlite and list building in a super easy way. I go back to access this course when I need a quick Mailerlite tutorial. Super helpful! I invested very early in my blogging journey in this great book. This ebook is filled with useful tips and clear explanations of important action strategies. When you’re serious about growing your blog traffic, this is the perfect book to get you started. Just use this code TSA5OFF today and get a $5 discount. I am sure you heard about this book. It is one of the best courses on Pinterest manual pinning strategies. With this strategy, Carly is getting more than 200K pageviews to her blog from Pinterest! Imagine yourself doing this? Well stop imagining and do it right with this valuable resource! This is an amazing course filled with Pinterest information, actionable tips, video training and lots more! When you want to start rocking your blog traffic with Pinterest, this must be your first investment. You get so much more than what you pay for, worth every cent. Just use this code TSA5OFF and get your $5 discount today! Discovering all the great blogging equipment and tools out there is great fun! The best tip here is to invest as you need something. Only buy the tools you need at this point because as you grow, your needs and budget will change. The Blue Yeti is used and recommended by a lot of pro-bloggers. Why? Because it is one of the most affordable microphones that works brilliantly. Blogger on the go? A must have to create profession videos and audio files. Perfect for all smartphones and tablets. No blogger can blog successfully without an awesome camera. And, even though our cell phones go a long way to take great pics, nothing beats the professional look of an awesome camera. A great choice when professional photos are a blogging priority. Perfect for the fashion and food blogger. This might not be a necessity in the beginning, but an absolute treat! You can’t imagine the difference this little gadget make to your blog photos! Time to snap like a pro. The great part about blogging is that there is always someone who walked the path before you. You seldom need to invest new blogging stones. You can simply invest in great resources from other brilliant bloggers who are already successful. Never be afraid to invest in your knowledge. In this list, you will find a powerful blogging book for everyone, no matter where they are in their blogging journey. Check it out! We all know Ruth Soukup from EBA, right? Grab her inside secrets in this how to blog book. Grow Your Business, Expand Your Platform, and Build a Nation of True Fans. The perfect choice when podcasting is the next blogging step. It’s free with the free Audible trial … Check it out now! Food blogger? Or just want to take awesome photos? Hundreds of Media Styling Tips, Tricks, and Secrets for Chefs, Artists, Bloggers, and Food Lovers. This book is the ultimate guide to succeed in beautiful blogging. I just had to have these! So cute! Very useful for every blogger. Essential for that much-needed caffeine fix! Now, who doesn’s love a cute baby outfit? If you are a blogger you know all about planning, right? Well don’t make it more difficult than it has to be. Grab one of these beautiful blog planners and plan like a pro! Very useful planner. Create Exceptional Content, Get More Done and Smash Through Your Blogging Goals. Your guide to defining your purpose, creating clarity, and building a year of killer content. Awesome 12-month planner. An Uncomplicated Guide To Simple Content Marketing: Battle the bounce. Retain more visitors with a clear system. Do you also one a hundred and ten little blogging notes lying around? Because you know you have to jot down those brilliant blog ideas as soon as you get it? I know the feeling! Time to get a bit more organized, ditch the sticky notes and invest in a useful notebook. Then next time you need a bit of inspiration, all your awesome blog post ideas will be nice together in one handy book! As bloggers, we are forever taking notes and in need of a new notebook. Isn’t amazing how much more we get done when our blogging space is well organized and practical? It sure is, so grab a couple of these affordable organizers and up your blogging game today. Organize the perfect creative space with these beautifully carved flower design desk organizers. The perfect complement with the desk organizer. For all those small goodies on your work table. To jot down those amazing blogging ideas and dreams as they pop up! A beautifully designed desk to meet all your blogging requirements. Ideal for the small blogging space. So beautiful and practical! If you have space, use it! Blogging can sometimes be tough. And why not make it a little bit more fun with inspirational gifts like these? A beautiful wall plaque to keep you motivated on the more difficult days. Love, love love this one! So cute and feminine! Need to be reminded how awesome you are? Then this one is for you. Perfect for the sentimental mom blogger. 52 Encouraging Truths to Hold On To. Perfect! So, have you found that perfect gift? Is it for yourself? There is quite a few on this page I would love to have! Leave a comment and let me know what is on your blogging gift wish list! Not sure about the Perfect Blogging Gift? And, follow this brilliant blogging board to stay updated with all the top blogging news and resources.